Bedside EconoRail - Bed Safety's Most Affordable Value - This Bedside EconoRail provides assistance in and out of bed. It weighs less than 2 lbs and supports 300 lbs. 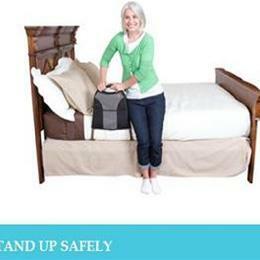 You can easily sit up in bed and stand up safely. Disassembles in seconds and includes a carrying case as a bonus.